A-Ronne II, cornerstone of musical theater, is an unsurpassed prototype for the stage and radio, a poem that draws from Latin and Greek, from German, from Dante’s Italian and from the distant surgeon of the "madrigale rappresentativo" from the end of the 16th century. There is neither a unique narration, nor a text set to music, but a "generator of multiple vocal and expressive situations" (Berio) around three simple themes: the beginning, the middle, and the end. The prodigious invention by Luciano Berio and his friend, poet Edoardo Sanguineti, combines a written text with vocal patterns that continually create new meanings: we see here a community of ideas with Georges Aperghis' theater. In Ingrid von Wantoch Rekowski's production, A-Ronne II becomes a masterful Mannerist painting for living puppets in which, stealthily, between grimaces and poses, between contortions and arrests, you can glimpse grace. A Lucilia Caesar and Les Brigittines production supported by the ministère de la Communauté française – service du Théâtre (with the collaboration of Théâtre National/Bruxelles). 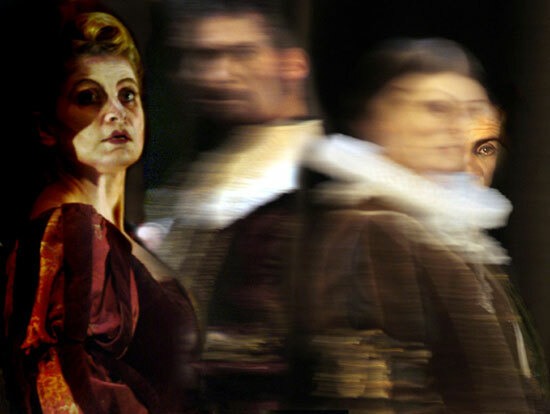 An Opéra Comique production.